Klara Grigorievna Rinkina, now 91, served as a Red Army medic during what Russians still call the Great Patriotic War (photo 1). A postcard sent from the front in December 1943 by Ida Ferer to her mother, sharing that she received an Order of the Red Star Award (photo 2). Kiev infantry school cadet Semyon Rabovsky (laying down, center) with classmates, 1941 (photo 3). Klara Grigorievna Rinkina is 91 years old and lives near Boston. She is 5 feet tall, with silver hair and a pleasant, round face. Rinkina is also a war hero, having served as a Red Army medic during what Russians still call the Great Patriotic War. On special occasions she wears a sweater pinned from neck to waist with medals. One of those special occasions came this month, during an exhibit opening at Pusey Library. Rinkina and five fellow veterans were there — all Jews, whose presence in the Red Army is a little-known story. 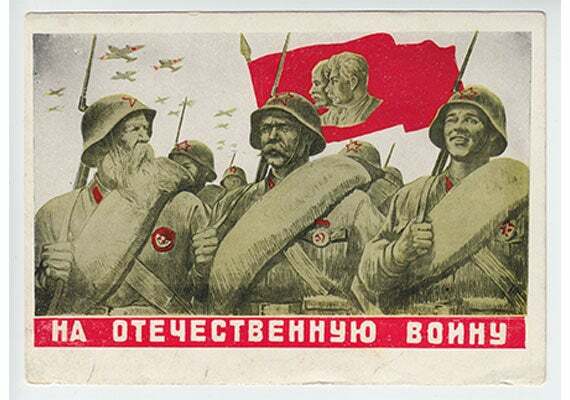 The Soviet Union gathered a fighting force of 20 million men and women during 1941-45, the largest army fielded during World War II. About 500,000 of the soldiers were Jewish; of these, a third died in combat. In 2005, the Blavatnik Family Foundation determined to redress the neglected story of Soviet Jewish fighters. One result is the exhibit running at the Pusey through Nov. 26: “Lives of the Great Patriotic War,” a multimedia glimpse at surviving Jewish veterans, along with a vivid recounting of the war’s wider context. At the heart of the project are personal stories. Making the traveling exhibit possible is an oral history project of the Blavatnik Archive Foundation. Since 2006, said project coordinator Julie Reines Chervinsky, the project has captured on high-definition video the stories of more than 1,100 Jewish veterans from 11 countries. The Blavatnik project includes archived interviews with 14 Jewish Red Army veterans in the Boston area, including Rinkina. Video excerpts from all 14 — and from many others — are part of the Pusey exhibit. 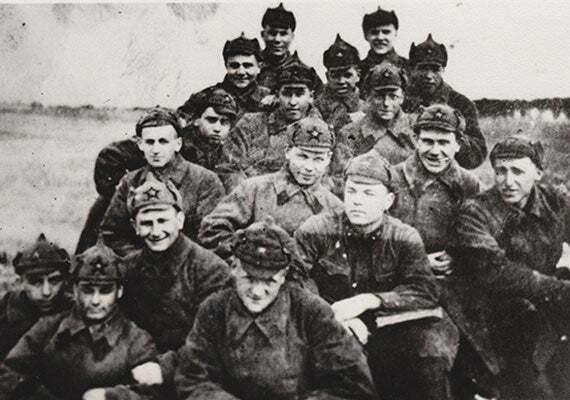 Cadet Avraham Levin (third row from bottom, on left) pictured with compatriots in Brest, Belarus in 1940. This portrait of a March 1945 command inspection of an observation station in Breslau shows Jewish soldier Dimitry Shore (far left). 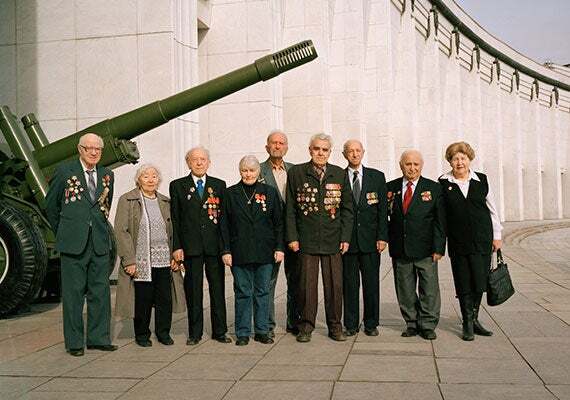 Soviet Jewish veterans in more recent times. Holocaust studies have gone a long way in documenting the fate of Jews during the war, but “this part of the history had not been captured,” said Chervinsky, who conducted about 100 of the interviews. Veterans talked about their lives before the war, she said; about their first encounters with the war; and sometimes about postwar humiliations, when Jews were stung and thwarted by explicitly anti-Semitic Soviet propaganda. 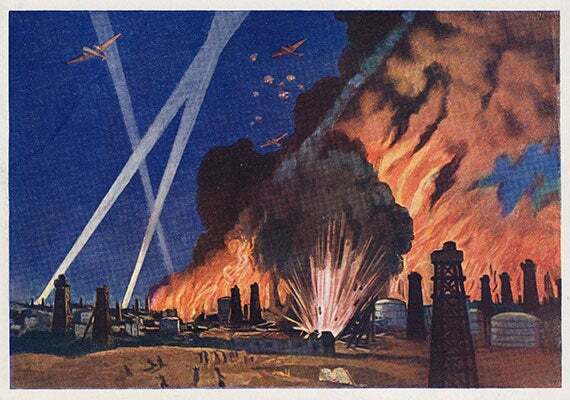 The war began for the Soviets on June 22, 1941, the day of the German invasion. Most Soviet Jews had given up outward professions of their faith decades before, and they were full citizens of Stalin’s universe. By the time of the invasion, many inhabited areas to the west that were hit hardest by the invasion, including Lithuania, Belarus, and parts of Ukraine. By the end of the war, 300 Jews had risen to the rank of general or admiral; 160,000 medals and orders were awarded — making Jews the fourth-largest Soviet “nationality” cited for courage. There was patriotism, but many Jewish veterans recorded a second major motivation: revenge, especially as the war shifted against the Germans, moved west, and revealed death camps. At 17, she had already escaped the barbed-wire-bound Jewish ghetto in her native Minsk, where pogroms were common. She had already joined a band of partisan fighters in a Belarus forest. And she had already nearly died, of pneumonia, before she was airlifted to Gorky, and then to Omsk in Siberia. “Look at you — you’re a pretty little girl,” the recruiter told her. He sent Rinkina to nurse’s training. She served from January 1942 until the end of the war, most often in combat theaters: Gomel, the winter Orsha offensives of 1943, Brest, Lodz, Prague, Warsaw, Krakow, and finally Berlin, where she was part of the famed 1st Belorussian Front attack group. Rinkina was at the Elbe River on April 25, 1945, when the Soviet and U.S. armies came together. “Very handsome, nice guys,” she said of the Americans, who traded watches for vodka. She showed photographs from a small scrapbook. In one, Rinkina leans against the flank of a stone lion in front of the bullet-pocked Reichstag. The victory was ecstatic; the war was years of hell. “It was a horrible experience,” said the old veteran’s daughter, Natalia Rinkina. “She never wants it to happen again.” Her mother still has nightmares, she added. The context of those nightmares was provided in a discussion before the exhibit opening, hosted by Provost Alan M. Garber. The panel was moderated by Board of Overseers member Tracy Palandjian ’93, M.B.A. ’97, and included Graham Allison, Douglas Dillon Professor of Government, and two-time ambassador R. Nicholas Burns, the Sultan of Oman Professor of International Relations. Now — with Syria, the Crimea, and other divisions — the United States and Russia are back in a “doldrum” resembling the Cold War, said Allison. At center stage is Vladimir Putin, who, said Burns, “has brought back Cold War passions.” Allison agreed. “If you were central casting, you couldn’t do better than Putin.” He called the present Russian regime “a KGB-retro machine,” with which “relations will not get better” any time soon. Underneath the present is the past, the panelists said. The psyche of the Russia people still echoes with the wounds of the Great Patriotic War, in which at least 20 million Soviets died. 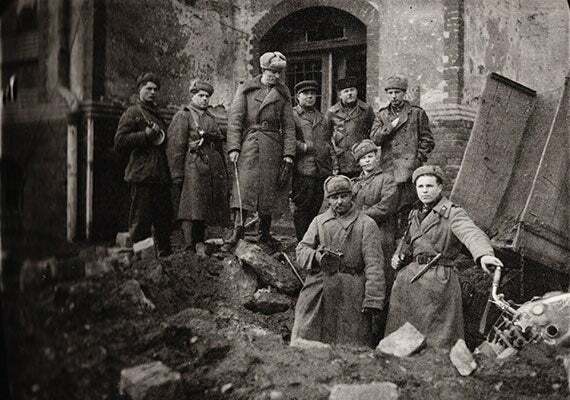 For every German killed fighting the USSR, 10 Soviets were killed. Visiting a place like St. Petersburg — besieged Leningrad during the war — “you can feel it,” said Burns. 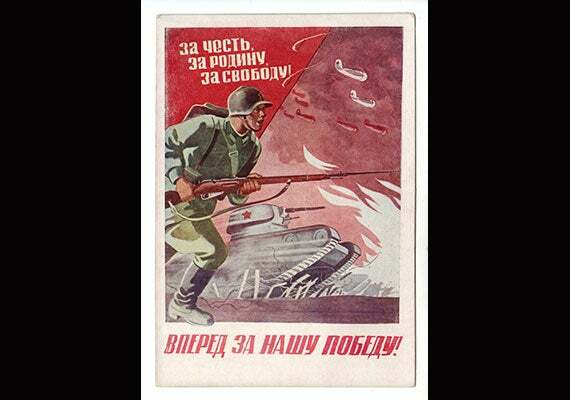 The Lives of the Great Patriotic War exhibition runs from October 23-November 26, 2014 in Pusey Library, Monday-Friday, 9am-5pm. No Harvard ID is required. At Houghton Library, Academy Award-winning filmmaker William Friedkin (left) gifted Harvard with the original documents for “The Friedkin Connection.” Friedkin, director of “The Exorcist” and “The French Connection,” was joined by his wife, Sherry Lansing (right). Friedkin’s memoir materials mark a new kind of collection for Harvard — cinema memoir.